Today is one of my favorite days of the year; the first official day of the NCAA Tournament. Yes, I know, the tourney actually started Tuesday night with the "First Four" games, but I'm a bit of a purist when it comes to this thing, so for me it starts with 64 teams on Thursday morning. Every season the first weekend of the tournament provides some upsets that make you scratch your head. With that in mind, let's look back at some of the more memorable surprises from the first two rounds of the NCAAs. The play was called "Pacer" by coach Homer Drew, and it was executed to perfection with a long inbounds pass to around half court, followed by a touch pass to Bryce Drew for the game winning 3, as No. 13 Valpo shocked No. 4 Ole Miss, 70-69. The score stood at 69-67 for the final 2:30, as both teams traded missed chances. SEC Player of the Year Ansu Sesay had an opportunity to put it away for the Rebels, but he missed two free throws with under 5 seconds left, setting up the stunning buzz-beater by Drew. The late, great Hall of Fame coach Al McGuire coined the phrase after freshman James Forrest nailed a nearly impossible turnaround 3-pointer with 0.8 seconds left on the clock to lift No. 7 Georgia Tech over No. 2 USC 79-78 in the second round of the 1992 tournament. The game wasn't the major shocker that some of the others on this list were, but because of the amazing call and the fact that the play is still talked about 20+ years later, it's extremely memorable. James Forrest took 374 shots that year, and his only made 3 is what sent the Yellow Jackets to the Sweet 16. In the '01 tourney, No. 2 Iowa State was expected to breeze past Hampton in the first round with no issues, but the Pirates had other ideas. Hampton was led by Tarvis Williams, who dominated the paint to the tune of 16 points, 13 rebounds and 6 blocks. The Hampton defense also wore down All-American point guard and future NBA player Jamaal Tinsley, holding him to just 9 points while forcing 5 turnovers. Iowa State still appeared to have seized control of the game in the second half, and at one point held an 11-point lead, but Hampton closed the game on a 14-2 run, capped with a short jumper by Williams with 6.9 seconds remaining, and Tinsley then missed a layup at the buzzer that would have won it for the Cyclones. Heading into the 2013 tournament, most people filling out their brackets didn't even know that Florida Gulf Coast was a school until they were cast as the No. 15 seed to take on No. 2 Georgetown. Many people (myself included) who had the Hoyas as a Final Four and National Champion pick watched in shock as the Eagles took over in the second half and cruised to a 10-point victory. Florida Gulf Coast lit up the scoreboard with several highlight reel dunks, running the Hoyas out of the building, 78-68. Norfolk State and Lehigh have very little in common, but for one night in the 2012 tournament, they shared the spotlight with two of the biggest upsets in NCAA history. Lehigh was led by future first round pick C.J. McCollum, who torched the Blue Devils for 30 points. The Mountain Hawks controlled the pace throughout, scoring 47 points in the second half to knock off Duke, 75-70. Missouri came into the 2012 NCAAs having won the Big 12 tournament and winning 30 games overall, but Norfolk State wasn't impressed. The Spartans were also led by a future NBA pick, Kyle O'Quinn, who battered the Tigers to the tune of 26 points and 14 boards. Amazingly for Norfolk State, their bench was held scoreless, but they still held on for the upset, 86-84. Unless you played for Weber State, you had no delusions of grandeur heading into the matchup against North Carolina, who was coming off back-to-back Final Four appearances. Granted, UNC had lost Vince Carter and Antawn Jamison the previous year, but as a No. 3 seed, no one expected them to lose in the first round. Weber State was led by dynamic shooting guard Harold Arceneaux, who scorched the Tar Heels for 36 points on 14-26 shooting from the field. Despite a furious late rally by UNC, Arceneaux's two free throws with less than 15 seconds left preserved the 76-74 upset. This was one of those games where you filled out your bracket blindly and put in the 2-seed to advance in the first round without spending any time thinking about the matchup. 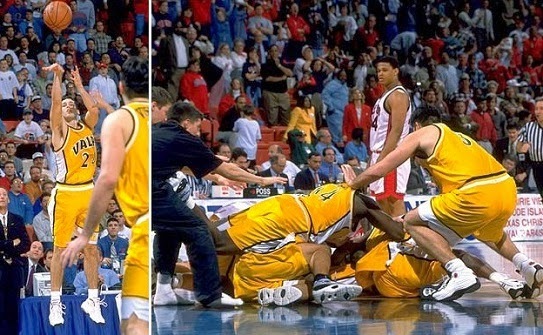 Needless to say, millions of people across the country had to cross off Arizona after Santa Clara pulled off the upset in the 1993 tournament, 63-61. The Wildcats were a title contender, led by future NBA players Chris Mills and Damon Stoudamire. Arizona was upset the year before by East Tennessee State, but no one saw them being blindsided two years in a row. Santa Clara was led by future Hall of Famer Steve Nash, who struggled from the field, but had several critical assists and hit multiple free throws in the final minute to salt away the victory. Nice walk down memory lane. Add Dayton over Ohio State to the list now as well! Tons of upsets already in this one. My bracket is screwed.